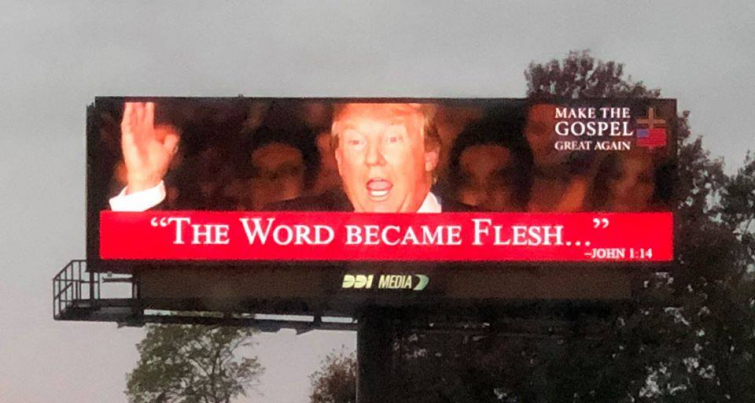 St. Louis Billboard Suggests President Trump Is "The Word Made Flesh"
In a viral photo snapped by Facebook user Martha K. Baker, a massive billboard along I-170 in St. Louis, Missouri features a photo of President Donald Trump above a quote from John 1:14 suggesting that the President is "the Word [who] became flesh," a title which John's gospel uses exclusively of Jesus Christ referring to his eternal nature. The ad also featured a logo which says "Make The Gospel Great Again." Baker, and countless other Christians, are shocked by the blasphemous sign. "When I saw this billboard on I-170 (the Innerbelt in St. Louis) between the Rock Road and Page Blvd. the other day, I nearly careered, caromed, and careened my car off the freeway," Baker said in her post. "'Make the Gospel Great Again'?! 'The Word Made Flesh'?! Blasphemy! Jesus!" According to local news outlet KMOV-4, the billboard's owner, DDI Media, announced on Monday that it didn't meet their requirements for political ads and was taken down. "...God does send his messengers to us, and just as King David liberated the faithful in his day, President Trump is doing this today through his protection of the unborn, defense of our land against foreign invaders and standing up for Israel," the post reads. "He surrounds himself with champions for Christian Rights –Mike Pence, Neil Gorsuch, and Brett Kavanaugh. Compared to the disaster of a president we had in Obama, how is this not the 'word become flesh' for Americans?"